Playing any sport requires shoes that will comfortably serve your feet well and comfortably. For soccer players, it can be a daunting task when it comes to choosing the best soccer cleats. They must find one that will suit their game, feet and offer good comfort during the game. And to help you in choosing the best cleat so far in the market for the 2017-2018 season we’ve come up with a list of the best 5 cleats for 2017-2018. Hence you should not look any farther. This top 5 list will give you some options so you can easily choose a cleat that suits your game type. Depending on your own liking and game, another thing you should consider while selecting a boot is probably your skills. Using a super-light boot on the pitch that offers you zero-protection is not the best idea. Having a super-flashy set of boots can serve to boost confidence and improve your first touch. If you’re considering Nike soccer cleats for your next pair then check out this top 5. Nike has created one of the best boots for soccer stars like Neymar. The Nike Phantom II FG combines luxurious comfort and practicality while on the football pitch. A good combination for feeling invincible during game play. These boots are made from high quality synthetic nylon. The synthetic nylon protects your feet, and contains technology that will give you a dashing edge come game-time. These boots perform best on firm natural grounds and have been designed specifically for modern day agile wingers and strikers. In addition to offering maximum agility, these boots also offer a barefoot-like touch. These cleats also give a lock-down, improved ball touch and support for a player in dynamic motion. The set of cleats also features Nike’s Flyknit technology. This means the cleat has an engineered texture for providing support. The outer-sole of this cleat comes with Chevron studs which immensely aids in instant acceleration. 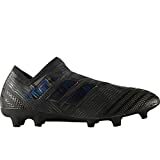 These soccer boots come mainly in a royal blue, and which fades towards a slightly darker shade of the colour in the collar and heel areas. Both the sole-plate and the lateral swooshes are made of chrome-metallic material, while the Volt is used for the Accents on the brandings and the studs and also on the swoosh borders. Technology wise, these boots remain unchanged and just similar to the previous launches of the second generation of Nike Magista Obra II boot from the Time To Shine Pack. These high end soccer boots also features a 1-piece Flyknit upper and a heightened collar that is meant for giving a sock like fit. 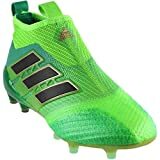 These high quality synthetic polyester these soccer cleats are made from makes them a good pick. Their upper is made of spandex textile which delivers superior breathability. You should be able to endure a long lasting finish. Its sole is also made from strong synthetic plastic that doesn’t scratch or crack easily whenever it comes in contact with other player’s shoes or the ball. As you’re aware, Nike are one of the leading sports shoes producing brand in the world, and sincerely speaking this shoes is one of their best designs. This Mercurial Superfly V is a beast in its make, the elastic ankle guard provides extra support to the ankle and this becomes a great boost for those players who like having a firm fit, since this aspect allows them to keep the ball regardless of the position, direction or situation that they are in. This boots are ultimately for controlling the ball that comes at high speeds, and has a perfect traction. The navy and chrome Mercurial Vapour XI 2017 boots features thin horizontal ridges, speed ribs, which are across the upper part of the shoe, and especially towards the front. This Nike Mercurial Vapor 11 comes with features such the synthetic leather upper, and this has been embossed with horizontal ridges; the all conditions technology for providing maximum comfort while playing; a tongueless upper construction and a compressed nylon sole-plate. These boots combine five distinct colours. The navy base of this cleat has been combined with red and orange lines, and also the chrome metallic Swoosh and Mercurial brandings. The sole-plate of this boot is made of chrome with some little hint of Volt. These boots combine various shades of grey colour with a bold orange fade. 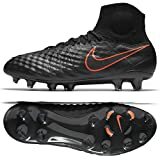 It is a great football cleat that has dark grey brandings that includes a large Swoosh on its front, and this completes the unique design of this Cristiano Ronaldo Nike Mercurial cleats chapter 4. You will get the signature logo of Cristiano Ronaldo on the instep of this boot. This football cleat comes with very interesting graphics. One specifically that features the logo of Cristiano Ronaldo alongside other tools that are needed for forging iron. The colours of this Nike Mercurial Superfly CR7 2017 boots have been inspired by the way iron looks at the time it is being forged. The boots are made from high quality synthetic nylon. The synthetic nylon serves to protect your feet from game-time tackles from opponents, and contains some technology that will surely give you an advantage over your opponents. These 5 are the best Nike soccer cleats for the season 2017-2018. They feature all the essential aspects needed for a great game including padding and durable material. Now you know!